Ah, Tuscany. Considered by many the birthplace of the Italian Renaissance where great thinkers and artists would gather. Its landscapes are the subject of countless paintings, poems, and dreams. It is here you find yourself with a dream of your own and a strong desire to make it a reality. With just a little bit of money, dedication, and a head for business, you will work to make your mark. Leveraging the cycles of nature to grow the prefect grape and make the greatest wine, you open your winery doors in hopes that Tuscany will prove to be all that you had dreamed it would be. Viticulture, by Stonemaier Games, is comprised of 1 game board, 6 Vineyard mats, 42 Vine cards, 36 Wine Order cards, 20 Summer Visitor cards, 20 Winter Visitor cards, 36 Worker meeples (in 6 different colors, 6 per player), 1 Temporary Worker, 60 Grape and Wine tokens, 6 Wake Up tokens (in 6 different colors, one per player), 6 Victory Point tokens (in 6 different colors, one per player), 42 Structure markers, 108 coins (in values of 1 and 5), and 1 First Player marker. As this is a review of the game’s prototype, we will not comment on the game’s production quality. To set up the game, first place the game board in the middle of the playing area. The game board should be within easy reach of all the players at all times. Second, give each player a Vineyard mat. This is placed in front of the owning player. Third, have each player select a color of their choice and give to them 6 Worker meeples, 1 Wake Up token, and 1 Victory Point token all of the same color. The Workers and Wake Up marker are temporarily set to one side of the player’s Vineyard mat. The Victory Point tokens should be placed on the “start” space of the Victory Point track located at the bottom of the game board. The player’s start with 3 Workers at their disposal. Fourth, separate and shuffle the Wine Order, Summer Visitor, Winter Visitor, and Vine cards (each deck will have its own color). Once shuffled, deal out to each player 1 Vine and 1 Summer Visitor card. Place the remaining decks, face-down, on their starting spaces located at the top of the game board. Fifth, place the Temporary Worker, Grape and Wine tokens, Structure markers, and coins to one side of the game board. From the coin pile, give each player 3 coins for a total money value of “3”. Game set up is now complete and your winery’s doors can be opened to the public! Determine who the first player will be to start the game and begin. The game is played in two locations. The first is the game board which represents the vineyard and the various buildings it contains. Here, cards are kept, Victory Points are recorded, workers are placed on the summer and winter actions, and the Wake Up chart keeps track of player order during the round. 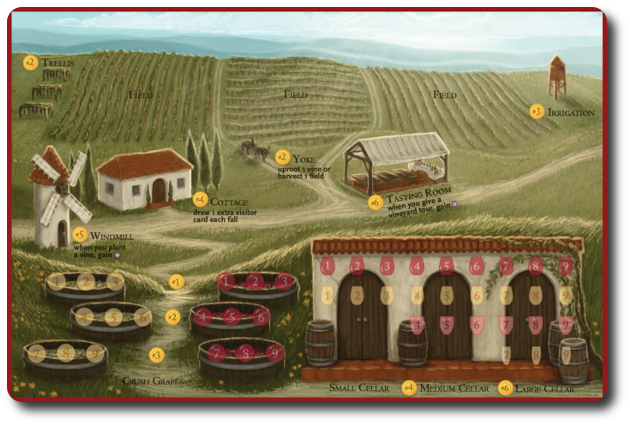 The second is the individual player’s Vineyard mat which keeps track of what Vine cards the player has planted, the values and quantity of grapes currently available on the player’s crush pad, what wines have been created and currently in storage in the player’s cellar, and what additional structures the player has personally built. Everything else in the game, workers, cards, markers, and tokens, are played either to the game board or to the player’s Vineyard mat. Any pieces not in use are simply kept to the side of the game board if they are used by all the players or to the side of the player’s Vineyard mat if they belong to that specific player. Note: The rules of the game are summarized here. For complete details and the most up-to-date rules, see the Kickstarter page. The game is played in rounds with four seasons (spring, summer, fall, and winter) with each player taking their turn following a strict player order. Player order will shift during the game, but the following steps are always completed in sequential order. During this season, all the players will place their Wake Up tokens on the Wake Up chart located on the game board. The placement of the tokens is important for two reasons. First, it determines the player order for the round. Second, depending on the “time” the player selects, they will gain a temporary benefit. This action allows the player to draw 1 Vine card and add it to their hand. This action allows the player to take one of their Vine cards and place it on one of their fields located on their Vineyard mat. A Vine card cannot be placed unless the required structures are built (noted on the card). Vine cards are either placed in an empty field or they can be stacked on top of another Vine card already in a field as long as the total value of the Vine cards in the field does not exceed “6”. If the player has the Windmill structure built, they also earn 1 Victory Point. This action allows the player to play a Summer Visitor card from their hand. The player discards the card and immediately takes the action described. This action allows the player to collect 2 coins (for a total value of “2”). If the player has the Tasting Room structure built, they also earn 1 Victory Point. This action allows the player to sell one or more Grape tokens for the price indicated on their Vineyard mat. The tokens are removed and the player collects the value in coins. This action is only available if the player has built the Yoke structure and allows the player to take one Vine card back into their hand they previously planted in their fields. Available during both the summer and winter season, a player can hire out one of their Worker meeples to collect 1 coin. There are no limits to the number of Workers that can be placed on this action location. In player order, each player will now draws 1 Summer Visitor or 1 Winter Visitor card, adding it to their hand. If the player has built the Cottage structure, they can draw one additional visitor card of their choice. This action allows the player to collect all the Vine cards in one field and adjust the values on their crush pads accordingly. The values are noted on the Vine cards and correspond to a specific color. These values are added and the marker is adjusted, adding to the total value. If the crush pad’s current maximum value has been reached, any additional points added to it are lost. This action allows the grapes on the crush pad to be made into a wine of one variety. Once created, the crush pad value is reduced as required and the cellar value is increased indicating a wine has been made and is now in cellar storage. If the cellar’s current maximum value has been reached, any additional points added to it are lost. This action allows the player to draw 1 Wine Order card and add it to their hand. This action allows the player to obtain another Worker meeple at the cost of 4 coins. This new Worker meeple is placed next to the training space on the game board and cannot be used during this round. This action allows the player to play a Winter Visitor card from their hand. The player discards the card and immediately takes the action described. This action allows the player to play a Wine Order card and fulfill its requirements by decreasing the types and number of wines in their cellar. Victory Points are adjusted accordingly, but do not discard the card. Instead, keep it out in front of the player as a reminder for residual payment that will be collected at the end of the year. This action is only available if the player has built the Yoke structure and allows the player the ability to harvest another field as described in the Harvest One Field action above. The round is now over. At the end of each year, the following actions are taken by all the players. The game ends after step 5 if any player has collected 20 or more Victory Points. If there is a tie, it is broken by determining which of the players has the highest valued wine in their cellar. If there is still a tie, it is broken by determining which of the players has the highest valued grapes on their crush pad. 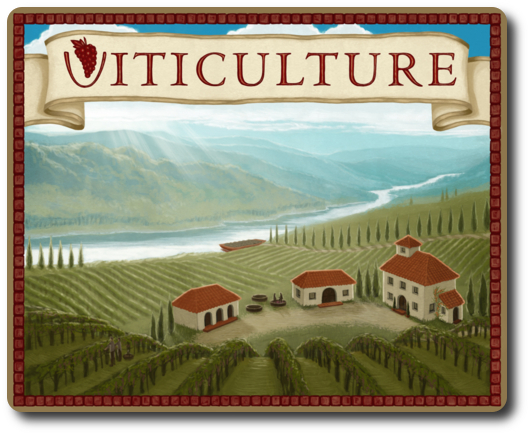 To learn more about Viticulture and read the full rules, see the Kickstarter page. When I told people I was going to review a game about winemaking and wine, they were surprised I was going to let my little geeks play it. I had to correct them to ensure they understood that the game was about owning a winery and had nothing to do with drinking alcoholic beverages. No more than The Great Fire of London 1666 requires the players to play with matches and dry kindling. Oddly enough, some were rather disappointed to hear it. The wine drinking, I mean, not the lack of pyrotechnics. 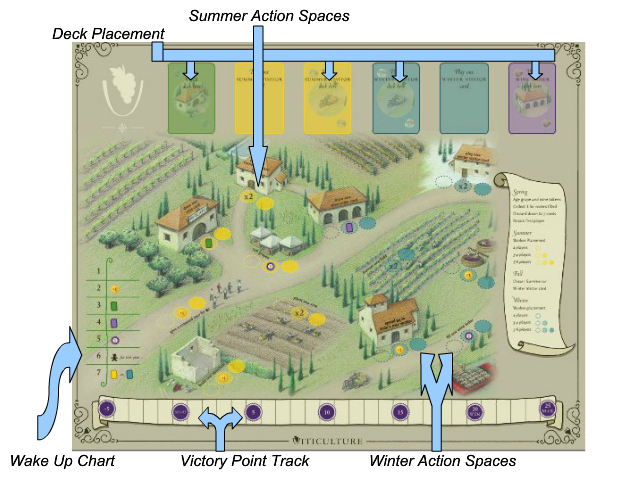 Viticulture appears to be a very straightforward, classically framed Euro-style board game. Meaning, a player will be challenge on two fronts. First, the overwhelming amount of player actions without a clear single-choice that would lead to victory, and second, a complete lack of luck. For the Gamer Geeks who enjoy Euro-style games, this is sure to be a real winner. The games rules also make the game play seem very casual with turns being brisk and the level of concentration required focused on short bursts of activity. This should appeal to the Parent Geeks. The Child Geeks have a mixed record when it comes to Euro-style games. They are either simply OK with them, broken by them, or hate them. Much of it has to do with the level of difficulty, of course, but also the game’s theme. Take, for example, Fallen City of Karez. My little geek was really rather excited by the game based on its description and theme. The game, however, beat him over the head with complicated choices and long turn sequences. Viticulture reads like an easy game to play and I know my oldest little geek has played more complicated games, but I am not at all certain how he’ll take to the theme. Making wine in Tuscany doesn’t sound like an appealing story from an 8-year-old’s perspective. I guess we’ll just have to see. Teaching this game will be made easier if you sit down with the players and walk them through a single year (round). By doing so, it should become obvious what a player can and cannot do, as well as the results of choices made in previous seasons at the end of the year. By teaching my 8-year-old the game by playing one round with him, it only took about 1o or so minutes before he was ready to go on his own. 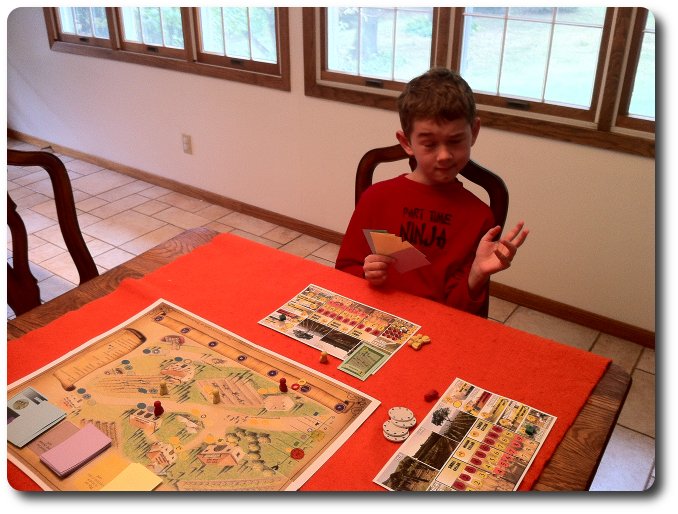 And so, while I reset the board for our first real round of the game, I asked him his thoughts on Viticulture so far. He has come so far from his days of being confused by Candy Land. So proud….(*sniff-sniff*). Let’s play the game and see if it makes for an excellent experience to quaff with friends and family or if it leaves a bitter taste from start to finish. My little geek played the game very well, collected Victory Points like a champ, and was very bored. While Viticulture was easy enough for my oldest little geek to play, it never captured his imagination or interest. Ultimately, it came down to theme. Making wine and running a winery was as about as interesting to him as the prospect of cleaning up his room. Which is to say, not at all. He finished the game, but didn’t agree to play another until we had more people at the table. Again, he played the game very well, and enjoyed the uptick in the Worker placement competition, but the game fell flat a second time. He shrugged it off as a “stuffy adult game” and said no thanks to a third try. Parent Geeks, being “stuffy adults”, really enjoyed Viticulture. Even the non-gamers had a good time and didn’t have much in the way of difficulty learning how to play. Conversations around the table eventually did turn towards wines and winemaking, but only because it was the subject at hand and what was being played at the table. A player need not know the first thing about wine or even know where Tuscany is to play the game and play it well. By the time the game was over, the Parent Geeks enjoyed themselves and were ready to open up a bottle of wine to celebrate the game’s success. Gamer Geeks enjoyed the game and were the most excited about how it allowed them to age their grapes and wines for more points. Everything else in the game felt familiar to them and they didn’t have much more to say about it other than it felt like a “classic Euro”. All the Gamer Geeks enjoyed the game and thought it well thought-out, intelligently designed, and best of all, well paced. Gamer Geeks, this is a solid Euro-style game, complete with worker placement, resource management, and zero luck. There is randomness, however, based on the cards drawn. In many respects, it does little in the way of bringing anything new to the table that seasoned Gamer Geeks have not seen before in Euro-style games. Viticulture is built on the backs of the many games that came before it, taking the best of those games’ features to create a very streamlined and clean game play experience. Perhaps the most worthy game mechanism of note is the way the player can age their grapes and wines. This allows the player to slowing increase their chances of making big points and hold off on selling too early. However, caution must be taken to ensure the game does not end before the player has a chance to sell their goods to the right buyer. Based on your peer groups enjoyment of the game, it is approved for your consumption. Parent Geeks, this is an easy to teach and easy to learn game. The choices given to the players might seem like a lot to consider, but the breakdown of available actions by season and the lack of any game related force to push a player into making a choice they don’t want to, allows for each player to take their time and consider what would be the logical steps to victory. The way to collect victory points is very clear, but the path to victory is not an easy walk. Players must balance their resources and make choices on when to harvest and create wines based on the cards they are dealt or what they think will be dealt to them in the future. The end result is a game that was found to be accessible and enjoyable by both Parent Geeks with and without much game play experience and by the non-gamers who enjoyed the theme. Child Geeks, this game was easy enough to play but never captured your test groups imagination or interest. As such, we cannot recommend this game for you. There are other games available on the market that have game mechanisms similar to this one that might provide a theme that is more appealing. We highly encourage you to work with your Parent Geeks to find them. After you have a few of those games under your belt, give Viticulture another try and see if the game play is what draws you in versus the theme. I think you’ll find that most Euro-style games focus very hard on the game play and consider the theme and narrative something of an afterthought. I rather enjoyed Viticulture and found it to be an excellent game that challenged me but never to a point where I was stuck. I also enjoyed how some of my actions were card driven, which made each player’s objective on the game board different each round. This also gave new players some much-needed direction as they started to reach the game’s halfway mark and still weren’t sure how to proceed. Grow more vines or make more wines? As soon as they started to collect wine buyers who gave out big points, they would turn all their attention to making wine like crazy. When that happened, it became obvious that a player had a good thing going and all the other players started to work as quickly as possible, too. This gave the game an exciting feeling to it as each Worker placement became a step on the racetrack intended to outdistance the other players. It was also nice to play a game where the competition was to the side of you, running the same race, but never an obstacle. The end result was a refreshing game, where an excellent mix of light economics, resource management, and worker placement blended together to create a fun time for my friends and family. I’m looking forward to playing this game again. If you are feeling peckish for a game that will linger on the taste buds with a slight hint of economic foresight, a robust worker placement at the back of the throat, followed by a mild aftertaste of pleasant resource management, drink a big glass full of Viticulture the next chance you get. Tagged Economic Games, Farming Games, Gamer Geek Approved, Parent Geek Approved, Prepublished Games. Bookmark the permalink. Specifically, people have asked how a game can not have any “luck” but still be “random”. “Luck” in games, by my definition, is the element of chance that a player has no control over. The best example is rolling dice to determine the outcome or availability of actions. A player might have the ability to adjust the rolled values slightly to a greater or lesser value, but not the dice itself. Whatever is rolled is what the player is stuck with. “Randomness” in games, by my definition, is the inclusion of seemingly inconsequential series of events that are presented to the player, but the player still has the ability to either engage fully or simply ignore. The Wine Order, Vine, Summer Visitor, and Winter Visitor cards in the game provide this random element. The player draws the cards but is never forced to us any of them. Indeed, a player must purposely place a Worker to use the cards in their hand, and what cards they have, they can choose to ignore completely if they wanted to. Insightful comments regarding simple vs. fun regarding kids. I had the exact same experience with my kids in playing Yspahan – a well-designed, easy-to-play game, but with a bland theme that did not grab my kids’ attention at all. I know there are numerous titles in this category. Emphasis on the “numerous”, Jason. I haven’t had a chance to play Yspahan yet. I’ll have to look into it! Very nice review as usual Father(Cyrus)Geek, thanks! One thing I haven’t seen anyone mention in their reviews of this game, is how it holds up for someone new to the genre. So far my fiancee and I have only played Agricola: All Creatures Big and Small. I’ve been looking for the next step up of entry-level worker placement games. How does this game hold up in that regard? I know this game borrows from many Euro’s of the past, in the developers view he improved on many of them. So would this unseat games like Stone Age and Lords of Waterdeep as a great introductory game to Euro’s and Worker Placement? Thanks for reading, Tyler, and taking the time to ask a question. I would group Stone Age and Viticulture in the same level of difficulty, with Viticulture being the easier of the two for a new player to grasp. The individual Vineyard mat makes the game a bit easier for new players because they have something they specifically own and control. The game board becomes locations where actions can be taken. Best of all, only certain locations are important some of the time, making it a bit easier for new players to keep the game straight in their head. But I should also note that Stone Age and Viticulture play and feel differently, meaning you could have both in your collection and not feel that they overlap. I am not a fan of Lords of Waterdeep (*gasp! *) and have never personally recommended it. One of our previous writers, Marty, did an excellent summary review of the game if you care to give it a read. Nor am I a fan of Agricola (*double gasp! *), despite everyone telling me I am wrong to not be overly in love with it. Meh. Can’t like everything. Knowing as much, it should come as no surprise that I would suggest to players Viticulture before Lords of Waterdeep or Agricola. If both Stone Age and Viticulture were on the table, I think it would come down to theme and narrative rather than game play. I think Viticulture would be easier of the two because the actions the players take have logical conclusions. Visible and logical cause and effect relationships make games a lot easier to learn how to play and provide a lower bar of entry for new players. Regardless, there is no game out there that is beyond your fiancee’s or your grasp. Some will take longer to learn and to play, and there will most certainly be themes that will be of more interest than others. There is no roadmap for game progression, which means any choice you make is a step in the right direction.